We act as your personal party consultant, help in menu selection and planning, and follow through on every detail to ensure your party is a smashing success. You take the credit and we do the work. Karen's Fireside is not your typical hall - we are a beautiful, fully re-decorated banquet room. We are caterers of exceptional food, and have redefined the meaning of service! We hope you'll take a moment and browse our website to learn more about us and visit our photo pages to experience our opulent atmosphere. We encourage you to visit our "pricing" page for details about our exciting wedding package. E-mail or call if you have questions regarding our package. Wedding Receptions, Prenuptial Dinners, Anniversary Celebrations, Business Events, Holiday Parties, Club Meetings...whatever your event, we can help you plan. Whether you have a small club that meets weekly, or you are planning a lavish, large affair, Karen's Fireside can accommodate your group. Our courtyard is aesthetically pleasing and conveniently located close to the dance floor. Our spacious dance floor leaves enough room for the DJ to be "front and center". Price includes tax and gratuity. We accept Visa, MasterCard and Discover Card. 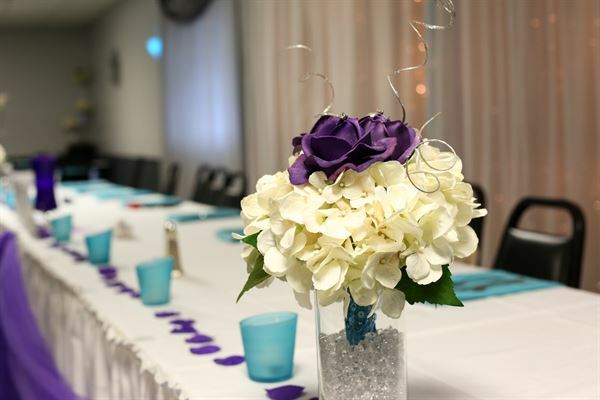 Our banquet room can accommodate groups of up to 300. Our bar is spacious, our bartenders friendly and efficient, and the bar is well-stocked with more than 75 liquors, wines and beers. Carpeting, round tables and padded black chairs help maintain the formal yet cozy atmosphere. Festive decorations are abundant throughout the room. Atmosphere/Decor: Fully decorated with weddings in mind. See our website for photos. My son and daughter had their Star Wars themed wedding reception at Karen’s Fireside, it was just beautiful! The decorations fit their theme and the food was awesome! I would recommend using their service for your party!